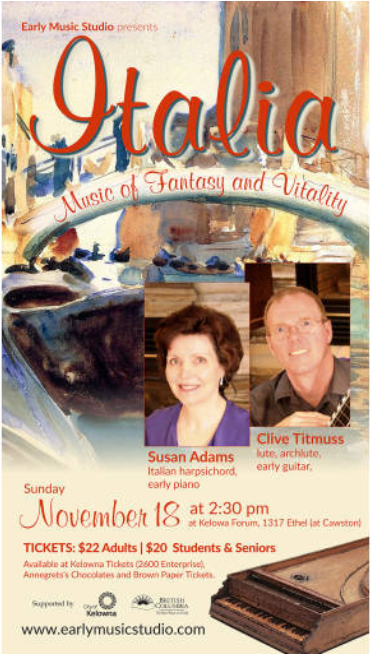 The Early Music Studio presents a concert of music from the 16th to early 19th Centuries played on period instruments: With Clive Titmuss, lute, archlute, early guitar, and Susan Adams, Italian harpsichord, early piano. The Italian spirit is fundamental to the history of music—they invented the violin, the piano, and they developed the whole idea of music as a performance art over centuries, beginning in the 1500s. Even the words “music” and “concert” are Italian! Early Music Studio is celebrating this pioneering and adventurous flowering in music with a concert devoted entirely to music by Italian composers, with music by Francesco, Frescobaldi, Piccinini, and Carulli. Enjoy the unique sound of period instruments in a lively and acoustically excellent setting in the heart of Kelowna. Ticket are available at Kelowna Tickets (2600 Enterprise), Annegret’s Chocolates and brownpapertickets.com.